dScope Series III Version 1.2x releases feature importing and exporting of analyzer buffers in WAV format (as well as the capability to play WAVs in real time from the generator). 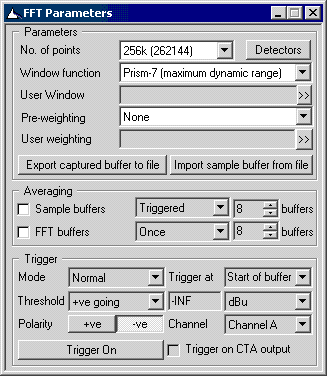 The buttons at the bottom of the FFT Parameters panel allow the FFT Analyzer's sample buffer to be exported or imported in WAV format. When exporting the current buffer, the channel to be saved must be selected if the FFTA is in two-channel mode. The sample buffer itself or the CTA Output buffer must be selected for saving if a CTA Output Trace is present on the Trace window. When importing a WAV file, the channel to be loaded must be selected if the FFTA is in two-channel mode. The sample buffer itself or the CTA Output buffer must be selected for loading if a CTA Output Trace is present on the Trace window. In case the WAV file to be imported is not of length 2^N samples, it is possible to specify whether to trim the data down to the next lower 2^N length, or whether to pad it with zeros up to the next higher 2^N length, or whether to adjust to the nearest 2^N length. 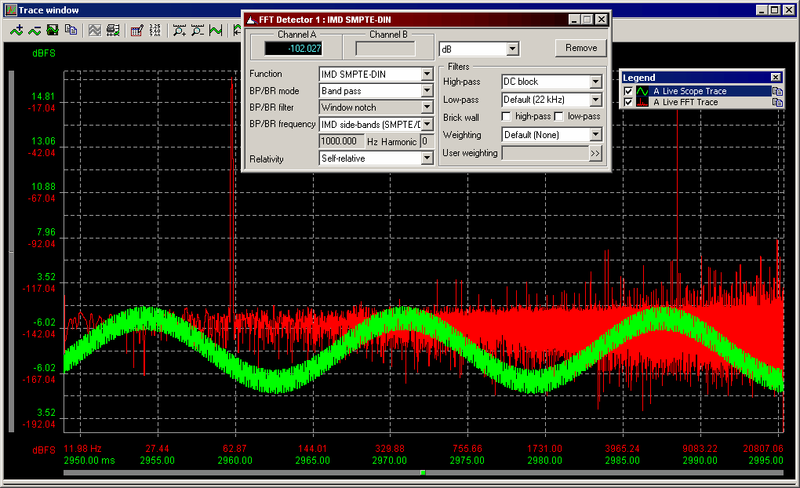 Selecting the SMPTE-DIN intermodulation WAV file produces the following FFT analysis. Note that the WAV file is quite long, and analysis was performed at 256k points. Click the image to see it full size (opens in a new window). The FFT Trace shows that the WAV file has apparently not been correctly dithered for its 16-bit word length. Since the dScope's FFT Detectors can be set up after sampling if required, it was an easy matter to call up a SMPTE/DIN analysis function (shown as FFT Detector 1) using the same tone frequencies as are in the WAV file, and have it display the calculated intermodulation distortion (-102.027dB). Since the dScope can support up to 40 two-channel FFT Detectors simultaneously (including user-defined analysis functions programmed in VBScript) it is possible to perform quite complex analyses. When importing a WAV file for analysis, the sample rate is taken from the WAV file header (if supported). The audio word length is extended to 24 bits by adding LS zeros (this has no effect on quality). The number of samples can be cropped or zero-extended to fit the current dScope analyzer buffer length, or the dScope can be set to automatically crop or extend to the nearest 2^N samples and set its buffer length accordingly. Two channel analysis can be performed by loading each analyzer channel from separate channels of the WAV file, or indeed from separate WAV files. Note that all of the above can be performed automatically by either VBScripting within the dScope or by controlling the dScope application externally.